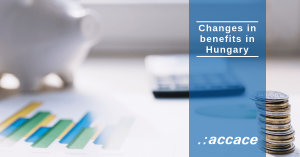 It is getting usual at the end of the year that companies must do a check-up and review their internal policies because of the changes in the rules of benefits in kind in Hungary. The check-up and review will be necessary this year as well because companies must prepare for the upcoming significant changes in the legislation. However, legislators have helped enterprises by publishing the new rules already in the summer of 2018, so there was and should have been enough time to prepare for the changes. How do the changes in benefit in kind affect companies? According to the benefit changes, the range of discounts will be further reduced in 2019. For those employers, who wish to use these additional benefits for tax saving purposes will have one choice only; the SZÉP card. All other items will be removed from the low-tax category. What does it mean in practice? From next year on, employees must receive all benefits in kind to their personal SZÉP card, which will have a minimal change in tax rate; from the current 34.22% to 34.5% (due to a change in the calculation method). The possibility of offering the current benefit items (e.g. local travel allowance, voluntary insurance fund, etc.) will come to an end, and will be taxed as part of the consolidated tax base from 2019 on. Benefit in kind, in the form of cash, which was introduced in 2018, ceases as well, thus no employees can be rewarded with this form of this benefit from next year on. Not only the low-tax benefits, but some of the tax-free benefits will disappear next year as well, such as the housing subsidies, student grants for student loan repayments, admission to sporting events, etc. What does not affect the change in benefit in kinds? Those forms of remunerations that have not been so popular among employers, such as the employee stock scheme or private health care, remain untouched. The change does not affect, so employees can be granted with business gifts, private use of corporate phone, or with an amount paid for voluntary insurance funds. Because of the occurred changes discussed above, it is expected that employers will have to review their internal regulations, but it shall not be forgotten that besides the tax saving functions of these benefits, based on studies, employees are delighted with the forms of benefits in kind and they like to choose which benefit they intend to use from the given framework. It is important, when compiling the next year’s plan, the managers responsible for economic decisions should seek the opinion of team leaders and colleagues before making the final decision.